Bayonne, New Jersey – A group of seniors from Bayonne High School’s Academy for Health and Medical Sciences will soon become New Jersey State certified emergency medical technicians. Investors Foundation, which supports non-profit organizations that enrich the diverse communities served by Investors Bank, provided the resources for students to attend and complete the EMT training. Launched in fall 2016, the Academy for Health and Medical Sciences is the high school’s fifth and newest academy. Each academy focuses on a specific area of study. The Academy for Health and Medical Sciences is a joint public and private sector effort by the Bayonne School District, the City, Jersey City Medical Center, RWJ/Barnabas Health, IMTT-Bayonne and the Investors Foundation. The Academy’s mission is to prepare high school students for college courses that relate to healthcare or pursue a career in the medical field following graduation. 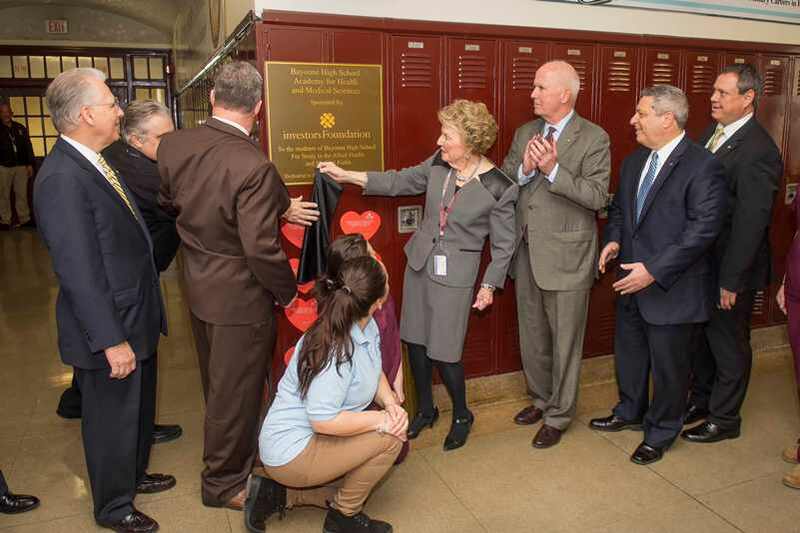 The Investors Foundation provided Bayonne High School with a $50,000 grant for the Academy. The grant represents a multi-year commitment to provide scholarships to seniors in the Academy to attend Jersey City Medical Center’s (JCMC) Emergency Medical Technician (EMT) training program, where they will take classes to obtain their EMT certification. EMT certification gives the students a practical and hands-on introduction to healthcare services. The training enables them to seek a career as an EMT, apply the experience in pursuit of their studies, or use the expertise they gain to move into other health, wellness or medical fields. The Foundation’s grant covers students’ expenses in applying for and participating in the JCMC’s EMT course. The costs include application fees, transportation to the class, textbooks, and equipment, such as blood pressure monitors and stethoscopes. This spring, students attend classes twice a week, from 6:30 p.m. to 10 p.m., and some Saturdays they ride along with and observe EMTs as they answer 911 calls. Dr. McGeehan also recognized the contributions by the Academy’s teachers, Amy Lavender and Janet Lojewski, and thanked Laura Craig for her tireless, professional efforts in coordinating the Academy’s development. As to the program’s content, director of the JCMC EMT Program Steve Cohen and instructor Michael Dinkel provide students with the skills needed to analyze a situation and determine whether it constitutes a medical emergency. If it does, students have the basic tools to respond, having learned how to measure blood pressure, perform CPR and provide basic first aid. In addition, students in the Academy are sharing information about the value of living healthy lifestyles with their classmates. As part of this initiative, the Academy students conducted a survey to assess the current healthy habits being practiced by their peers. During the meeting with the Academy’s students, Investors Bank executives, Bayonne Mayor Jimmy Davis, and Bayonne School District Trustees were able to view a presentation of the survey data. The findings show how a growing percentage of Bayonne high school students are making healthier choices when it comes to food choices, exercise, and sleep routines.